Current Status: merged with Mosaic Lodge on 03/19/2004 (2004-33) to form Amity-Mosaic Lodge. by Wor. W. Robert Leach. A hundred years! Beyond the life span of most men, a century-has always had a fascination as an anniversary or milestone in the history of man and his institutions. So too, with Amity Lodge, and a review of her past gives us a better appreciation of the wonderful heritage that is ours. To look to the beginnings of Amity Lodge one must start with the beginnings of Freemasonry in Danvers, for the seed was planted as early as the year 1778. The Revolution was under way and perhaps because of this the Masons then living in town felt the need of their own Lodge. One was formed and was named United States Lodge in honor of the new nation then taking shape. However, United States Lodge had a brief and apparently stormy history until it was "erased from the Grand Lodge books" in 1788. All tangible evidence of the Lodge, charter, jewels, regalia and records, was consumed when the home of Richard Skidmore at the Port was destroyed by fire in 1805. But the seed had been sown on the soil of Danvers, and in 1808 ten Masons of the town gathered and formed Jordan Association, which later became Jordan Lodge. They grew and prospered, holding their meetings at the Berry Tavern at the Plains until the bitterness of the anti-Masonic period caused a cessation of their meetings for degree work from 1828 to 1845. During this time the furniture, jewels and regalia were moved to South Danvers and when the Lodge again resumed work it was at South Danvers. Then in 1855 South Danvers, later to become Peabody, was set off as a separate town and again the town of Danvers was left without a Masonic Lodge. But interest in the Ancient Craft remained strong, and by the year 1863 there were more than sixty Masons residing in the town, many of whom were members of Jordan Lodge. Again the nation was at war and again the Masons of Danvers felt the need of their own Lodge. Twenty-six of them gathered together on September 2, 1863 and adopted the following resolution: "That in our opinion the good of Masonry as well as the Fraternity of the town needs the establishment of a Lodge of Free and Accepted Masons forthwith." The following twenty-six signed the petition for dispensation that was sent to Grand Lodge: George Tapley, Albert W. Howe, T. C. Everett, J. Q. A. Bachelder, Richard B. Hood, J. W. Legroo, Robbins Raymond, William L. Hyde, Alfred Porter, Ira P. Pope, Nathan K. Cross, Dean Kimball, N. P. Merriam, Warren Sheldon, Christopher Hammond, Preston M. Chase, Philemon Putnam, George H. Perkins, Benjamin R. Tibbetts, William Wells, Reuel B. Pray, Charles Porter, E. P. Davis, Ebenezer Hunt, Charles N. Ingalls and Benjamin F. Porter. It was unanimously voted that the Lodge should be called Amity, signifying "fellowship in love." Our Brethren lost no time. By the end of the month they were •working under a dispensation dated September 28, 1863. Wor. George Tapley had been elected Master, Bro. Albert W. Howe, Senior Warden, Bro. Benjamin R. Tibbetts, Junior Warden, Bro. Dean Kimball, Treasurer, and Bro. Theophilus C. Everett, Secretary. Bank Hall had been selected as the permanent meeting-place, and the ladies had volunteered to assist in preparing the jail by fitting the carpet. And so it has been ever since with the ladies always willing to help the Lodge though they are not a part of it. Many of the Brethren contributed necessary items for the use of the Lodge, among them a volume of the Holy Scripture for the altar by Bro. Samuel P. Fowler, a Master's Chair, the one now in the entrance hall, by Bro. Albert Sylvester, a Tyler's sword by Bro. R. B. Pray, and a pair of knockers air the tyled door by Bro. William Wells. The first Regular Communication was held on September 30, 1863 and five petitions for the Degrees were received. At the next meeting of the Lodge the five were initiated, and "Bro. Warren Porter, having been ordered to report at the Navy Yard in Brooklyn, by dispensation was passed to the degree of Fellow Craft and Raised to the Sublime Degree of Master Mason," becoming the first Mason raised in Amity Lodge. The Lodge was closed in due form at 1:00 a.m. The new Lodge prospered and by the end of the first year had over sixty members. Its year of probation ended, the Lodge petitioned Grand Lodge for a Charter, and on Monday evening, September 26, 1864 Amity Lodge was consecrated by Most Worshipful William Parkman, Grand Master, and the Grand Lodge officers. Following the consecration ceremonies the Lodge in procession proceeded to the Universalist Church for the installation of officers, followed by a banquet in the hall below, which was served to about four hundred. Here the records state that, "After the guests were seated, a blessing was invoked by the Grand Chaplain and a general assault upon the eatables took place." We can gather from this that Masons and their ladies, at least in Amity Lodge, have not changed much in the past hundred years. Having completed its first year, Amity Lodge now started along a path of steady growth and service to its members. The records of these early years show many cases of assistance to worthy Brethren or their widows. The year 1870 brought a great change to Masonry in Danvers. Seventeen Masons petitioned Grand Lodge to form a new Lodge within the town, and with the permission of Amity Lodge, dispensation was granted by Grand Lodge. In 1871 Mosaic Lodge was formed and again Wor. George Tapley was the first master. Suitable arrangements were made for the new Lodge to use Amity Lodge's quarters, and the two Lodges prospered and grew in membership. Tragedy struck late in 1897 when a fire occurred at Bank Hall, and from December of that year until the following April the meetings were held at Carroll's Hall. The Lodge was then able to return to a newly decorated Lodge room at Bank Hall. Among those who served in the war with Spain was Wor. A. Preston Chase, who had become Secretary of the Lodge the year previous. He was a Captain in the United States Volunteer Army and at the end of the war "Cap" returned to serve as Secretary until 1937, a long and enviable record. On December 13, 1905 Amity Lodge received a great honor when one of her members and Past Masters was elected Grand Master of Masons in Massachusetts. John Albert Blake had served Amity Lodge and the District well, and during his term as Grand Master he continued in a larger service by greatly furthering the establishment of a Masonic Home in Massachusetts. As Grand Master he, "ever a strong believer in the service such a Home could render, presented the matter to that fundamental source of accomplishment, the Fraternity at large." As a result of the combined efforts of many dedicated Masons the Home was in operation by 1911. Most Wor. Bro. Blake served as the first Relief Commissioner of Grand Lodge, an office he held until November 27, 1926, when "Massachusetts Masonry suffered a great loss in the death of Most Wor.John Albert Blake, Relief Commissioner, to whose energy and love of Masonry we owe so much in the development of our home and the happy relations with our residents." Fifty years had now passed and Amity Lodge celebrated the great and important occasion in fitting manner. With Wor. Ferdinand A. Butler presiding, the Fiftieth Anniversary Meeting was held on Sunday, September 28, 1913, followed by Divine Services at the Maple Street Congregational Church. The following evening at Town Hall, a reception to the Grand Lodge officers, banquet and ball were held. Wor. Albert W. Howe, the second Master of Amity Lodge, Bro. George H. Perkins and Bro. William L. Hyde, the sole survivors of the charter members of the Lodge, were present. Four of the Lodge officers of 1913 are still members of Amity Lodge: Wor. Harry S. Clark, who was Senior Warden; Wor. James H. Perry, Junior Warden; Wor. Porter D. Brown, Junior Deacon; and Wor. Albert W. Dogherty, Inside Sentinel. The following year darkness began to spread over the earth with the start of World War I. When the United States entered the conflict, many of the members and sons of members of Amity Lodge went into the armed forces, serving well in many ranks and places. Of the Lodge members who served, four, Brothers Hadley M. McPhetres, Ralph W. Lane, Merrit H. Barnes and Andrew B. Robertson, gave their lives in the service of their country. The Lodge was greatly saddened in 1919 by the death of the Presiding Master, Wor. William H. Damon, the only Master to die while in office. Many years later, an event that he could not foresee occurred, when his son, our present Treasurer, became Master. The war years, and especially the years following, brought on a great increase in membership in the Craft, and the Lodges were fast outgrowing their quarters. Countless hours of committee work at numerous meetings, the work of dedicated Brethren from both Lodges, came to fruition on July 8, 1925 when Most Worshipful Dudley H. Ferrell, Grand Master, assisted by the Masters of Amity and Mosaic Lodges, Wor. N. Woodbury Bragdon and Wor. Arthur W. Gay, laid the corner-stone for a new Mosaic Temple. The former Universalist Church had been purchased and with an addition on the front it was converted into one of the most beautiful Masonic Temples in the area. An event long to be remembered was the dedication of the new Temple on June 23, 1926 when Wor. Peter J. Widen was Master. The ancient and colorful ceremonies were conducted by the Senior Grand Warden, Frank H. Hilton, acting on behalf of the Grand Master. The Lodge room was filled to overflowing. A banquet followed in the hall below, where the assembled Brethren were addressed by Most Wor. Bro. Ferrell. When Most Wor. Bro. John Albert Blake, Senior Past Master of Amity Lodge and Senior Past Grand Master was introduced, he was "received with tumultuous applause". It was perhaps fitting that the first degree work done in the new Temple by Amity Lodge was a Third Degree worked by the Past Masters, thus effectively linking the old with the new. The decade of the 1930's was a trying time for Amity and Mosaic Lodges. The expenses of the new Temple combined with the "great depression" that had spread over the country worked extreme financial hardship on the Lodges and their faithful members. Membership declined, but those who remained only worked harder to preserve their beloved Lodges and Temple. Then as the nation slowly emerged from the depression, so too did the Lodges, gradually improving their financial and numerical strength. As World War II spread around the globe during the next decade, along with it came an increased number of applicants to Masonry as young men sought to ally themselves with the Fraternity before going to distant parts of the world. Surely Masonry offers a man a strong bond of brotherhood that is a stay and support in the devastations of war. Many members of the Lodge were engaged in the various theatres of war, but Amity Lodge and her members were indeed fortunate that all returned. The period from those years to the present has been one of rapid and steady growth in membership for Amity Lodge as well as for Ac Fraternity at large. During the past few years our Temple las been restored to its original beauty through the efforts of a large number of the Brethren of Danvers. One of the great contributions of our Grand Lodge during this period has been the Masonic Blood Bank, and the members of Amity Lodge have been especially generous in this endeavor, giving of their very life's Hood that others might live. Mosaic Lodges for forty-five years. A hundred years! A century of change. The way of life in Danvers and in the world has changed. Yet through it all one thing has remained the same. Those who knock at the door of Amity Lodge are still taught the principles of just and upright manhood, of faith, hope and charity, and of the expectation of a life yet to come. The stones are still laid level and plumb. The corners are still square. Amity Lodge is now ready to start its second hundred years of "fellowship in love." History of Amity Lodge 1963—1988. As the year 1963 drew near, a spirit of anticipation grew, and active participation by many members culminated in a One Hundredth Anniversary celebration long to be remembered. Most Worshipful A. Neill Osgood, Grand Master, and the Grand Lodge of Massachusetts joined Worshipful Edward E. Arrington and Amity Lodge on September 28, 1963, to celebrate the Centennial Meeting of the Lodge. A highlight was the presentation of the Joseph Warren Medal, for distinguished service, to Worshipful Porter D. Brown, ninety-one years of age and still a regular attendant at all meetings. A Centennial Service of Worship and a Centennial Banquet and Ball at later dates completed the celebration, and the Lodge started on its second century. The enthusiasm of the anniversary carried on, and for the next several years the Lodge grew in activity and membership to a high of 547 members in 1976. It was also a period when Amity Lodge was known for the excellent Degree work of the officers. The decades of the '60s and '70s were periods of change in attitudes and goals of the populace in general, and sometimes not for the better. It was also a period of change, sometimes subtle, but usually for the better in Amity Lodge. As a Lodge and as individual Masons we began to emerge from the shell of the Lodge Room and make ourselves better known to the community at large. A large step in this direction was the establishment of the Amity Lodge Bloodmobile at the Temple, a successful project which continues to the present. The Lodge also began to engage in more social events, aside from an annual Ladies' Night. Christmas Parties for the Children, and one for members and guests: Dinner Dances: Ladies invited to regular Lodge dinners with entertainment during Degree work. These all broadened participation by the member's family. For several years the Lodge exchanged visits with Washington Lodge #61 of Manchester, New Hampshire, and a "Lodge of Table Instruction" has become an annual event. An occasional event has been joint dinner and social gatherings with the local Knights of Columbus Council. All of the "innovations" have helped to dispel the old image of Masonry as a "secret society". We are in and of the community. During the past twenty-five years the Lodge Room and other apartments have been refurbished with the assistance of the ladies, and the mortgage on the Temple has been retired. These were accomplished with help from all organizations using the Temple. A century and a quarter! During that time eighteen hundred and ninety-five men have signed the By-Laws and become members of Amity Lodge. Ninety of these have had the privilege of serving the Lodge as Master. Each has made his unique contribution, large or small, that has had a part in making Amity Lodge what it is today. I could not, I dare not, attempt to say who was the greatest among them. Each has been a stone in the building of the Temple and who can say which one is necessary or which is indispensable. Some have served in official capacities over long periods of years and have left an indelible mark on the fabric of the Lodge. Wor. A. Preston Chase served as Secretary for forty years. Wor. John B. Mason as organist for forty-four years, and Right Worshipful W. Robert Leach as secretary for thirty-eight years. Others have served with distinction as Grand Lodge Officers including that of the Grand Master. Some worked and sacrificed so we might have our Temple; such a one was Wor. Walter T Creese. A host have put the teachings of our fraternity to practical use in their service to their fellow townsmen in local and state government. But perhaps the best known among them all and the most beloved by his Brethren was Brother John Metzgar who served as Tyler of Amity and Mosaic Lodges for forty-five years. A hundred and twenty-five years of change. The way of life in Danvers and the world has changed. Yet through it all one thing has remained the same. Those who knock at the door of Amity Lodge are still taught the principles of just and upright manhood, of faith, hope and charity, and of the expectation of a life yet to come. The stones are still laid level and plumb. The comers are still square. Amity Lodge is now well into its second hundred years of "fellowship in love". This Lodge, having completed its probationary year under Dispensation, was Constituted on the evening of the 25th of Sept., by the M. W. Grand Lodge. Its Hall was Dedicated at the same time, and its Officers were Publicly Installed. The latter ceremony took place in the Universalist Church, and in the presence of a large assemblage of ladies and gentlemen. The services were performed by the M. W. Grand Master, with his usual ability and good taste, and apparently to the great acceptance and satisfaction of the audience. After the ceremonies at the Church, the Brethren, with their ladies and invited guests, sat down lo a fine Collation, and spent a very agreeable hour in social enjoyment and the interchange of opinions. A. W. Howe, W. M.
B. R. Tibbetts, S. W.
J. Q. A. Batchelder, J. W.
W. L. Hyde, S. D.
J. W. Legro, J. D.
P. M. Chase, S. S.
Rev. R. F. Chase, Chap. Worshipful Richard C. De Normandie of Boston, assisted by Worshipful Brother Walter F. Creese of Danvers as Marshal, installed the officers of Amity Lodge, Danvers, Mass., Thursday, January 13th. The installation exercises were held in Masonic Hall but were public in character. Excellent music by a quartet added to the effectiveness of the ceremonies. An interesting incident in the exercises was the installation of John Metzger as Tyler for the 38th consecutive year and the fact was fittingly noted by the installing officer in original and feeling remarks, while the quartette sang "Auld Lang Syne." The new officers are as follows: Harry M. Wilkins, Worshipful Master; K. A. Butler, Senior Warden; Harry S. Clark, Junior Warden: Wallace P. Hood, Treasurer; A. Preston Chase, Secretary; Frank W. Seabury, Chaplain: Sanford E. Gillette, Marshal; J. Herbert Berry, Senior Deacon; Porter D. Brown, Junior Deacon; A. L. Perkins, Jr., Senior Steward; Harry T. Wood, Junior Steward; William H. Damon, Inside Sentinel; John B. Mason, Organist; John Metzger, Tyler. Proceeding to Town hall at 7.30 o'clock the large and then greatly augmented gathering beheld beautiful decorations of palms on the stage, a horseshoe of colored electric lights on the proscenium arch and colored ropes across the hall studded with vari-colored lights, while the 100-candle power sunbursts in the centre of the hall and the many other lights flooded the hall with brilliancy — to say nothing of the bright people present. A sumptuous banquet with music and an entertainment completed the festivities of the evening. Wor. 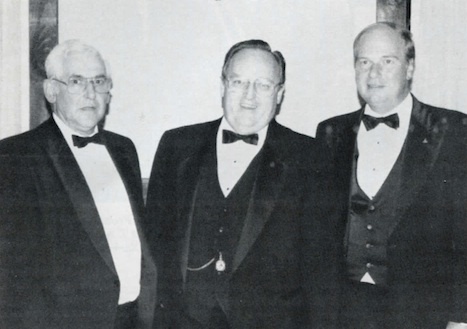 Samuel F. Gynan, TROWEL rep. for Amity Lodge of Danvers in the Lynn 8th District, reports of the Lodge's 125th anniversary celebration held on Oct. 1, 1988, with Grand Master Albert T. Ames, accompanied by a distinguished suite, in attendance. A history of the Lodge was read by R. W. W. Robert Leach, Secretary emeritus, who also wrote the Lodge's 100th anniversary 25 years previously. Wor. Leach retired as Secretary after a 38-year tenure, just one week prior to the anniversary celebration. The assembled Brethren and guests accorded him a fine round of applause when apprised of the many years of service he had rendered. Another round of applause was given to Bro. Raymond Eaton, who was introduced as the senior Lodge member having continuous membership. Many of the distinguished guests were called upon to remark and in addition, offered their congratulations to the Lodge for its longevity. The Grand Master, as the last speaker, extolled the officers and Brethren for the fine observance of the memorable occasion. At the conclusion, the Lodge was recessed and a social period was held in the function hall followed by a dinner-dance at the nearby Steven James restaurant. Commemorative gifts were given to the ladies, Brethren, and their guests. Wor. Daniel Koban, Master of Amity Lodge; M. W. Albert T. Ames, Grand Master; and R. W. Donald W. Gillis, Jr., D. D. G. M, Lynn 8th District. This page was last modified on 5 June 2018, at 14:55.